The 1988 US Mustang offered by Don Hiller and Gene Fercodini of U.S. Mustang for Ford Mustang's 25th anniversary.. To get one of these cars you had to buy a non-metallic, single colored Mustang GT from Lombard Ford of Winstead Connecticut and then ask for the optional $3,495 U.S. Mustang Trim & Performance package. 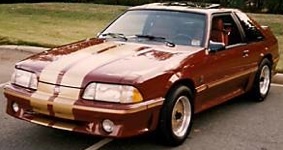 This package included the gold over-the-top stripes, gold body side molding trim inserts, custom gold anodized wheels(incorrect wheels shown in example), U.S. Mustang front fender emblems, four wheel disc brakes, 3.73:1 traction-loc rear axle (standard offerings were 2.73:1 and 3.08:1), 5 speed transmission, and the SVO 140 mph speedometer. This is a 1988 Mustang GT originally modified by Don Hiller and Gene Fercodini of U.S. Mustang for Ford Mustang's 25th anniversary. To get one of these cars you had to buy a non-metallic, non-two-tone painted Mustang GT from Lombard Ford of Winstead Connecticut and then ask for the optional $3,495 U.S. Mustang Trim & Performance package. This package included the gold over-the-top stripes, gold body side molding trim inserts, custom gold anodized wheels, U.S. Mustang front fender emblems, four wheel disc brakes, 3.73:1 traction-loc rear axle (standard offerings were 2.73:1 and 3.08:1), 5 speed transmission, and the SVO 140 mph speedometer.